You may wonder why another recipe for an Oatmeal Cookie? The answer is that this is not an ordinary Oatmeal Cookie, because it has a surprise ingredient, rice cereal. Rice cereal has a delightful crispy crunch which adds even more texture to this soft and chewy cookie with wonderfully crisp edges. Besides the rice cereal and rolled oats, chocolate also makes an appearance, and you can use semi sweet, bittersweet, milk or even white chocolate chips. Terrific with a glass of ice cold milk. Now, I will say that this Oatmeal Cookie batter also contains a few other unusual ingredients. First, I have added a teaspoon of ground coffee (not instant), which I think adds a pleasant hint of coffee flavor. (You can, however, leave it out.) I also included 1/2 tablespoon of light corn syrup (can use honey, golden syrup, or glucose) which contributes to this cookie's soft and chewy texture. (Again, you can leave it out.) Once the batter is made, the next step is to form the cookies. If the batter is firm, you can make the cookies straight away. If you find the batter a little soft, refrigerate for about an hour, or until firm. In fact, if you don't want to bake all the cookies right away, you can cover and refrigerate the batter for a few days and bake the cookies when you have a craving. So, should you use old fashioned or quick-cooking rolled oats? My personal perference is to use old fashioned. Because while both types start with oats that are cleaned, toasted, and hulled to become what we call oat groats, old fashioned rolled oats have a thicker texture. And that results in a chewy oatmeal cookie. 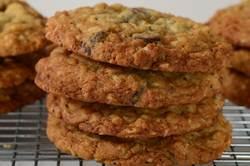 Crispy Oatmeal Cookies: Preheat oven to 375 degrees F (190 degrees C). Line two baking sheets with parchment paper, or lightly butter or spray with a non stick cooking spray.